Whenever Thursdays roll around, I would invariably think of Eastin Chinese Chef Yong Kam Wah's exquisite Thursday Night Specials. It seems Thursdays tend to be popular dining out night with the hotel guests hence the chef decides he would proffer some choice morsels to delight them. During the recent mooncake sampling session, we were treated to samplings of the chef's Thursday Night Specials. The starter of Deluxe Twin Hot Combination pairs a wispy and crisp Prawn Yam Puff with a Lemongrass Skewer of Grilled Fish/Prawn Paste wrapped in Bacon. I like the latter for its imaginative combination of textures and piquant flavours, accentuated by a dollop of tantalisingly tart and spicy green bird's eye chilli and garlic dip. Although I wasn't big on soups, the Double Boiled Fish Soup with Apples went down well for its salubrious and delicate nuances. The sweet, hearty broth bears fruity hints that temper whatever fishy accent there is. It's not everyday one gets to savour old-school faves like Braised Eight Treasures Duck so this classic speciality definitely went swimmingly with me. As expected, the duck was fall of the bone tender, its inherent gaminess bestowing a deliciously deep-seated overtone to the yummy stuffing that comprises water chestnuts, mushroom, lotus seeds and other goodies. If you're a farn toong (rice fiend so to speak), you'd want to douse the unctuous brown sauce over a bowl of fluffy white rice to savour the superb nuances. Looking distinctly like mahjong tiles, the Deep Fried Stuffed Boneless Chicken is another surefire palate-pleaser. You must appreciate the chef's patience and artistry in creating those irresistible layers that has crispy deep-fried chicken skin adorned with toasted almond flakes and fish paste alternating with mashed salted egg yolk and seaweed. I must confess I'm not a big fan of cabbage but surprisingly, I relished every mouthful of the Braised Tian Jin Cabbage with Dried Scallop. The soft, tender leafs appeared almost velvety and well-infused with the dried scallops' subtle umami sea-brininess. The Mini Lotus Leaf Rice could be a dead ringer for choong - those rice dumplings that we eat for Duan Wu Jie except the rice was less compactly wrapped in lotus leaves. Dried shrimps, salted egg yolk and sliced Chinese sausage lend the rice their scrumptiously rich accent. Before we proceed to sample the hotel's mooncake selection, a Double-Boiled Pear with American Figs dessert broth was served to cleanse our palate. Light and mildly sweet, the concoction is just the tonic to pave the way for the asssortment of baked and snow skin mini mooncakes. The most outstanding variant this year for Eastin is undoubtedly its Mini Crystal Durian Paste mooncakes - a special edition to commemorate the Hotel’s 15th anniversary celebration. Filled with fresh Musang King durian flesh, the snowskin mooncake makes its presence felt by the sheer aroma of the King of Fruit alone. More exotic fillings include Dragon Fruit paste, White Coffee and Corn, and Chocolate - inventive flavours to suit today's discerning palates. The hotel has a total of 15 varieties to choose from so those looking to buy Mid-Autumn Fest gifts for their family and friends should be over the moon. Available from RM10+ per piece and from RM80+ per box until 19 September 2013 for take-away and dine-in. Dishes for the Thursday Night Specials Promotion starts from RM 30++ per portion and will be served until end of September. Patrons will also be serenaded by the J Musical Live Band who will be performing evergreen Chinese and English hits from the 70’s and 80’s from 7.30pm-8.15pm and 8.45pm -9.30pm. For reservations, please call Ee Chinese Cuisine at 03 -7628 7338 or log onto www.eastin.com. True to its reputation as a seafood paradise, Sandakan is unrivalled when it comes King Neptune's deep-sea denizens. Be it at the Central Market or the floating water villages that dot its coastline, seafood crazy foodies will find themselves inundated with the freshest catch of the day. 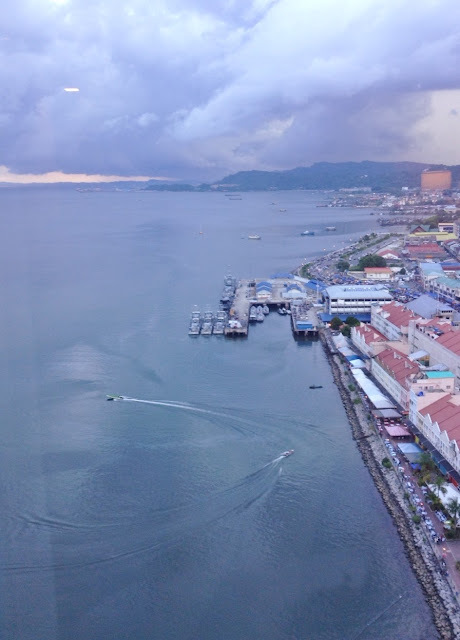 A quick walking tour of the Central Market across from the Four Points by Sheraton Sandakan was enough to blow us away; the sheer amount and variety of seafood that's sold there left us simply in awe. Whether fresh and glistening or dried and salted...you name it, they have it in all shapes, sizes and colours. Honestly, it was an eye-opening experience to see so many different and unfamiliar species of fish, shellfish and seaweed sold there. We spotted heaps of parrot fish, saury, clams, stingrays, giant groupers and mackerels, local mud and flower crabs, banana prawns, snappers and even puffer fish with doe-like eyes and spotted thorny hides. Locals told us that they would eat this deep-fried...talk about playing Russian roulette. The market itself is a fascinating kaleidoscope of activities, chock-a-block with rows and rows of stalls selling the freshest and most vivid hued vegetables, herbs and spices, assorted seaweed, poultry and meat, dried goods, baking ingredients, confectionery and bakery items, local sweet treats and fruits. We also nipped upstairs to sample the market's famous Char Yuk Meen (Fried Pork Noodles). According to our Sandakan friends, the stall started in 1940 but has continued to draw a capacity crowd daily with its famed homemade slippery smooth ribbons of 'kueh teow' (flat rice noodle) topped with sliced Hakka-style fried pork marinated in 'nam yue' (red fermented beancurd). You can choose to enjoy the noodles 'kon lou' (dry-tossed with a drizzle of soya sauce) or laden with a hearty pork-based broth. The latter is undoubtedly the runaway favourite; the simple broth so hearty and flavourful that it's good to the last drop. Nearby are several stalls offering 'chap farn' (economical mixed rice) with a tempting selection of home-style dishes such as braised pork, deep-fried chicken, stir-fried 'hum choy' (salted mustard leaves), 'yong tau foo' (stuffed beancurd with fish paste), etc. No visit to Sandakan is complete without a meal at Sim Sim Water Village. Friendly rivalry sees two similarly named seafood restaurants sited cheek by jowl but it's business as usual as both draw their own share of customers. Built on stilts, the restaurant seating extends all the way out to sea on sturdy wooden platforms. Insulated boxes filled with oxygenated sea water flaunt live swimming fishes and other seafood: lobsters, prawns, sea cucumber, clams and oysters among others. On the night of our visit, we saw a worker brought in a huge lobster and oysters whose shells are as big as a dinner plate. Supply apparently came from local fisherfolks who sell their catch to the restaurateur here. Our sumptuous feast included a slab of Sandakan's signature salted talang deep-fried and served with fresh kalamansi juice, steamed hard shell clams and oysters in lime juice, garlic and bird's eye chilli, stir-fried crabs and squid in caramelised dark soya sauce, Teochew-style steamed red snapper with tangy lime juice, minced garlic and chilli, and diced beancurd, stir-fried Sabah vegetables (a type of local fern known locally as cekur or sayur manis), honeyed lamb ribs and butter prawns. Taste-wise the dishes are unpretentious; the simple preparations merely a mean to enhance the seafood's freshness. The butter prawns, salted fish and steamed red snapper really had us hooked. I also like Sandakan's ham yue (salted talang) that's deep-fried until it's slightly crisp. Served with lime juice, its mellow brininess tastes surprisingly similar to blue cheese. Serving soon! More Sandakan's homegrown fare to tickle your tastebuds.